Recently Pakistan took one record from India. Can you imagine in which sector? I am sure this may not be your first answer. The record is for the number of mangrove trees planted in one day. With 5,41,176 young mangroves planted by 300 volunteers in one day in Pakistan broke the previous record of 4,47,874 held by India. The mangrove tree planting event was held in the vast wetland of Indus river delta of southern Sindh province 150km south east of Karachi - which is also a designated Ramsar site. The trees are expected to occupy 325ha of land. "This is a wonderful example of partnership between government, local communities and the private sector for a common cause, for conservation,"said Richard Garstang, the head of WWF Pakistan Wetlands Programme. 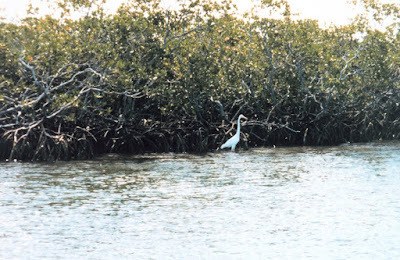 Mangroves plays a crucial role in the ecosystem. It not only provides habitat for many organisms like fish but also protect the coast from erosion, storm surge(during hurricanes) etc. Mangroves extensive root system is very effective in dissipating the energy of waves.But because of the extensive destruction of these mangroves; along with rich habitat, natural protection provided to the coast from powerful ocean waves also lost. Now the erosion is increasing in alarming rate.Despite the restoration efforts; mangroves are disappearing very fast. We are building costly stone walls to prevent erosion which have to rebuilt after some years. Even the presence of stone walls didn't prevent attacks by powerful ocean waves. 1379.9 km of Indian coastline out of 7516.6 km are affected by erosion. Its is practically difficult, expensive and not a good solution to build stonewalls throughout the coastline affected by erosion. But mangroves are a good solution- a practical as well as natural one. Anyway this type of healthy competition will allow both countries to gain some mutual trust. And this should be the type of competition not guns, bombs and terrorism.